THE DETROIT EMERALDS-LET’S GET TOGETHER. By 1978, when The Detroit Emeralds released their final album, Let’s Get Together, much had happened to them. The last few years had been eventful, and marked a change in the The Detroit Emeralds’ fortunes. For their first three albums, The Detroit Emeralds it seemed they could do wrong. Their three albums charted and The Detroit Emeralds enjoyed ten hit singles. Then in 1974, The Detroit Emeralds were in chaos. The group was on the verge of splitting up. Indeed, there were two versions of The Detroit Emeralds touring. The end looked neigh for The Detroit Emeralds. Somehow, they came back from the brink. After three years away from the recording studio, The Detroit Emeralds recorded their fourth album Feel The Need. On its release, it became The Detroit Emeralds’ first album not to chart. At least the title-track reached number twenty-two in the US R&B Charts. However, The Detroit Emeralds were at a crossroads. For a group whose music had been part of the soundtrack the seventies, things weren’t looking good. Their next album would be crucial. It had to be a commercial success. Would The Detroit Emeralds’ fifth album, Let’s Get Together, which was recently released by Ace Records, mark a revival in their fortunes? That’s what I’ll tell you, once I’ve told you about The Detroit Emeralds’ career. Originally, The Detroit Emeralds were formed in the sixties, they were just called The Emeralds. They were formed by the four Tilmon brothers from Little Rock, Arkansas. The original lineup featured Ivory, Abrim, Raymond and Cleophus Tilmon. Then when The Emeralds headed to Detroit, there were some changes afoot. Raymond and Cleophus decided they didn’t want to relocate to Detroit. So, Ivory and Abrim were joined by their friend James Mitchell. The other change was the name. No longer were group called The Emeralds. No. Now based in Detroit, they became The Detroit Emeralds. This just happened to coincide with their first hit single. Show Time was released in 1968, on the Ric Tic label. It reached number twenty-two in the US R&B Charts. This was the first of a trio of singles The Detroit Emeralds released for Ric Tic. Shades Down and (I’m An Ordinary Man) Take Me The Way I Am. These three tracks marked the start of a ten year musical journey for The Detroit Emeralds. Two years later, The Detroit Emeralds’ career began in earnest. Before that, their career stalled. Having released three singles for Ric Tic, suddenly, the label was taken over by Motown. For The Detroit Emeralds, that was a disaster. Like so many other artists, The Detroit Emeralds were lost in the Motown machine. So they decided to sign to a newly formed label. At least they were wanted there. Armen Baladian had just founded Westbound Records, when The Detroit Emeralds signed to the new label. This would prove to be a home from home for The Detroit Emeralds. They recorded the best music of their career at Westbound. During the next few years, The Detroit Emeralds were a hit-making machine. This started in 1970, in Memphis. When The Detroit Emeralds were on tour in 1970, the tour swung through Memphis. So, they took the opportunity to start recording some demos. With Willie Mitchell, a few rhythm tracks were laid down at United Sound. The Detroit Emeralds were given a Hi sound makeover.Then when The Detroit Emeralds were back home in Detroit, their vocals and strings were over-dubbed. This approach worked, resulting in two hit singles and for The Detroit Emeralds. If I Lose Your Love was released as a single in 1970, on Westbound Records, who The Detroit Emeralds had signed to. It reached number thirty-two in the US R&B Charts. Then I Can’t See Myself Doing Without You reached number forty-one in the US R&B Charts later in 1970. The following year, The Detroit Emeralds enjoyed one of the most successful years of their ten year recording career. 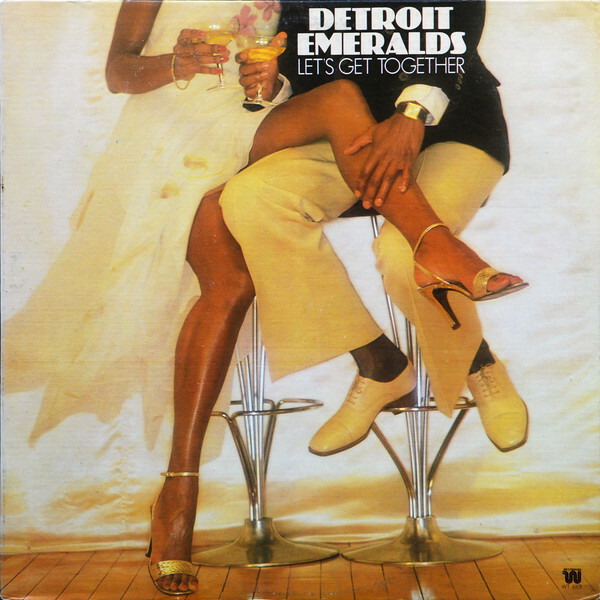 Do Me Right was The Detroit Emeralds’ debut album. Released in 1971, Do Me Right reached number 151 in the US Billboard 200 and number twenty-three in the US R&B Charts. The Detroit Emeralds enjoyed two hit singles. This included the title-track, which reached number forty-three in the US Billboard 100 and number seven in the US R&B Charts. Wear This Ring (With Love) then reached number ninety-one in the US Billboard 100 and number eighteen in the US R&B Charts. The Detroit Emeralds career at Westbound had started well. It would soon get even better. 1972 saw The Detroit Emeralds release their sophomore album You Want It, You Got It. It surpassed the success of number seventy-eight in the US Billboard 200 and number thirty-seven in the US R&B Charts. The title-track reached number thirty-six in the US Billboard 100 and number five in the US R&B Charts. Then Baby Let Me Take You (In My Arms) reached number twenty-four in the US Billboard 100 and number four in the US R&B Charts. The final single of 1972s Feel The Need In Me, reached just 110 in the US Billboard 100 and number twenty-two in the US R&B Charts. Little did The Detroit Emeralds realize, that they’d just enjoyed the most successful year of their career. After enjoying the most successful album of their career, plus a trio of hit singles, The Detroit Emeralds’ third album I’m In Love, failed to replicate the success of its predecessors. It stalled at number 181 in the US Billboard 200, but reached number twenty-seven in the US R&B Charts in 1973. The singles didn’t fare as well as previous ones. Things started well when You’re Gettin’ A Little Too Smart reached number ten in the US R&B Charts. A reissue of You Want It, You Got and then I Think Of You failed to chart. At least Lee reached number seventy-nine in the US R&B Charts. After that, The Detroit Emeralds almost split-up. Things started to go wrong in late 1973, when Abrim Tilmon left The Detroit Emeralds to pursue a solo career. He released two singles as A.C. Tilmon and The Detroit Emeralds. Meanwhile Ivory Tilmon and James Mitchell decided to form a new group. They added Carl Johnson of Chapter Eight. However, they couldn’t use The Detroit Emeralds name. It had been copyrighted by Westbound, who now owned the name. So, Ivory, James and Carl signed to Fee Records as Now. However, neither Abrim nor Now were enjoying much in the way of success. Given disco was now a huge commercial success this was a lost opportunity. As 1976 dawned, disco was the most popular musical genre. Disco was providing the soundtrack to American life. The Detroit Emeralds who could’ve and should’ve been disco Kings were the forgotten men of music. Then out of nowhere, The Detroit Emeralds’ career was kickstarted. Remixes were now the flavor of the months. Remixers, who often, weren’t musicians or even musically trained, were forging careers by giving tracks a musical makeover. Breaks were extended and songs became much more dance-floor friendly. The Detroit Emeralds’ Feel The Need In Me was remixed, and transformed into a seven minute epic. Suddenly, The Detroit Emeralds were back in the public eye. Woody Wilson, who owned Fee Records, urged the members of The Detroit Emeralds to put their differences aside. So, Abrim Tilmon made amends with Ivory Timmon and James Mitchell. Abrim was now ready to become part of The Detroit Emeralds again. However, there was a problem. The Detroit Emeralds were signed to Fee Records. To allow the group to record, Woody leant Ivory Timmon, James Mitchell and Marvin Willis to Westbound. Now four years after the release of their third album, The Detroit Emeralds released the followup Feel The Need. On its released in 1977, Feel The Need failed to chart. This was a first. Never before had an album by The Detroit Emeralds failed to chart. For everyone involved that worked so hard to make the album happen, this must have been disappointing. However, The Detroit Emeralds had been away for four years. Music had changed a lot since their previous album. Maybe the followup to Feel The Need, Let’s Get Together would chart? As work began on Let’s Get Together, The Detroit Emeralds must have known it was make or break. Eight songs were chosen for Let’s Get Together. Abrim Tilmon cowrote and co-produced five tracks. In total, seven tracks were written by members of the band. Only Call Me (Traveling Lady) wasn’t written by the band. These eight tracks were recorded by The Detroit Emeralds at various studios, including Ardent Recording Studios, Memphis. Recording of Let’s Get Together saw The Detroit Emeralds accompanied by a rhythm section that featured bassists Eddie Watkins and Roderick Chandler, drummers Jerry Jones and Michael Calhoun plus guitarists Dennis Coffey and Bruce Nazarian. The Detroit Symphony Orchestra added strings and woodwind, Brandye contributed backing vocals and Lorenzo Brown played percussion. Production was split between members of the band. Let’s Get Together saw The Detroit Emeralds pulling together. It was as if they realized their future career was at stake. On the release of Let’s Get Together in 1978, the album failed to chart. Despite being a “Tom Moulton Mix,” the album failed commercially. The Detroit Emeralds career was all but over. They’d released their last album. That was Let’s Get Together, which I’ll tell you about. Let’s Get Together opens with the title-track. It was written by McKinley Cunningham, James Mitchell and Marvin Willis. Bursts of blazing horns join cascading, dancing strings and a pounding, funky rhythm section. Along with sweeping harmonies, this sets the scene for the lead vocal. Helped along by harmonies, James Mitchell struts and vamps his way confidently through the track. Behind him, some of Detroit’s session musicians seamlessly fuse soul, funk and disco. Turn On Lady like the first three tracks, was produced by James Mitchell, Mike Theodore and Marvin Willis. Brandye supply breathy, sassy harmonies while swathes of strings sweep and swirl. Horns bray and rasp, while punchy harmonies give way to The Detroit Emeralds. Urgent and soulful, the baton passes to James. He feeds off the harmonies and they urge each other to greater heights. It’s as if they realise the seriousness of the situation. Failure wasn’t an option. Having swept along, a breakdown sees the arrangement stripped back. Latin and funk combine, as The Detroit Emeralds vamp their way through the arrangement. Then the arrangement builds back up and heads towards its dramatic, dance-floor friendly high. Traveling Man has a much more understated sound. Flourishes of harpsichord give way to a dark, cinematic sound. That comes courtesy of the strings. They provide the backdrop for James half-spoken vocal. It gives way to a heartfelt and heartbreakingly beautiful vocal. He becomes the “Traveling Man.” He wants to fill his partner’s life: “with beautiful things” and “treat her like a Queen.” What follows is quite simply, one of the best songs on Let’s Get Together. James vocal brings the lyrics to life. So much so, they seem real. The harmonies compliment his vocal and feature The Detroit Emeralds at their best. Cleveland Horne, Anthony Jones and Abrim Tilmon penned Treat Her Like A Lady. It’s an uber funky track, where The Detroit Emeralds veer between tough, vampish vocals to a much more soulful, then urgent style. This they do against an arrangement where wah-wah guitars join a funky rhythm section, braying horns and cascading strings. For four minutes, The Detroit Emeralds seem to be inspired by The Temptations, circa the early seventies. Soulful, funky, slick, edgy and tough describe this track perfectly. Chiming guitars and flourishes of strings open I Just Don’t Know About This Girl Of Mine. Heartfelt, wistful harmonies are accompanied by the rhythm section and keyboards. Bursts of grizzled horns and strings provide the backdrop for James vocal. Confusion, frustration, suspicion torment him, while cooing harmonies join the lush strings in accompanying him. This results in a track that’s dramatic, heartfelt, soulful and sometimes, sassy. Have A Good Day closes Let’s Get Together. Horns blaze, strings sweep and the rhythm section drive the arrangement along. James vocal is like a rap, before the harmonies strut in. They’re in the groove, just like the rhythm section. As James struts his confidently through the song, strings dance and the bass buzzes. Harmonies sweep in and out. James vamps and raps. All the time, the rest of The Detroit Emeralds sing: “Have A Good Day” as disco, soul and funk unite one last time. Let’s Get Together was make or break for The Detroit Emeralds. Their career rested on the commercial success of Let’s Get Together. Their fourth album Feel The Need, had failed to chart. This was a first. Never before, had a Detroit Emeralds failed commercially. There was, as they say, a first time for everything. Then lightning struck twice in the same place, when Let’s Get Together failed commercially. After that, The Detroit Emeralds called it a day. They went their own way. Part of the problem was, music had changed in the four years they’d been away. Between The Detroit Emeralds’ third album, 1973s I’m In Love and 1977s Feel The Need, music changed. Disco became a musical phenomenon. The Detroit Emeralds had previously been a soul and funk band, but decided to jump on the disco bandwagon. For some groups, this rejuvenated their career. Not even the much vaunted “Tom Moulton Mix” rejuvenated The Detroit Emeralds career. No. It’s because the disco roller coaster was about to come off the rails. A year later, disco had died. Maybe, if Let’s Get Together had been released a year earlier, it would’ve been a commercial success? Instead, Let’s Get Together was the wrong album at the wrong time. Let’s Get Together failed to rejuvenate The Detroit Emeralds career. Ironically, the highlight of Let’s Get Together, which was recently released by Ace Records, was the soulful delights of Traveling Man. Sadly, it was the only slow song on Let’s Get Together. It’s easily the highlight of Let’s Get Together. Maybe if Let’s Get Together had featured more soulful songs like Traveling Man, the album would’ve been a bigger success? Who knows, maybe a side of soul and a side of dance-floor friendly tracks would’ve resulted in an album that rejuvenated The Detroit Emeralds career. Sadly, that wasn’t to be. Let’s Get Together proved to be The Detroit Emeralds’ final album. After that, they went their own ways. At least it saw them end their career with an album of quality music. During the eight tracks on Let’s Get Together, disco, funk and soul were combined by The Detroit Emeralds, as they took their musical bow on Let’s Get Together. Standout Tracks: Let’s Get Together, Traveling Man, I Can’t Seem To Forget and I Just Don’t Know About This Girl Of Mine. ← GEORGE JACKSON-OLD FRIEND-THE FAME RECORDINGS VOLUME 3.